Heating and cooling systems installed in a home may vary from central furnaces, boilers, electric baseboards to heat pumps. The most common type of heating/cooling (HVAC) system used in USA is the central furnace – which may be singles stage or multi stage. A heat pump is used in regions with moderate climate, where summer/winter is not that extreme any time. In this article, we guide you through heat pump thermostat models, ideal to control the heat pump in your home. As I wrote above, a majority (90%) of homes in USA rely on central furnace based systems, or boiler based systems or heat pump systems. Only about 10% of homes in America uses electric baseboards for heating (these homes would be either old constructions or located in places where electricity is cheap). In regions with moderate climate, a heat pump (with emergency heat) alone is usually enough for home heating/cooling. Homes located in extreme weather regions often use a heat pump along with the central furnace/boiler based HVAC system. Before going ahead, let’s see the best heat pump thermostats in a nutshell. Heat Pump – How it functions? A heat pump is simply a heat exchange system which can be used to heat or cool a place. Heat pumps use the outside air to heat/cool a home during winter/summer. A heat pump can be used for climate control in a home through out the year – during winter and summer. A heat pump can be used for cooling, heating and dehumidifying. The working principle of a heat pump is same as that of a refrigerator. In simple words, it makes the cool place cooler and hot place hotter – by pumping out the heat from the cooler area to hotter area. Heat pumps use air, water or ground as a medium to pump out the heat. Accordingly they are classified as air source, water source and geothermal heat pumps (ground source). The most common model is the air source heat pump. During winters, a heat pump (air source) moves heat from the outdoor air to your indoors, making your rooms cosy and warm. Similarly, during summers, a heat pump will pump out the heat from your indoors to the outdoors making your rooms cooler. As you know it now, a heat pump simply transfers heat from one place to the other. Compared to electric baseboards and electric furnaces, heat pumps offer better efficiency in terms of electricity usage, as they don’t use resistance heating. Also, with new advancements, high efficiency heat pumps are available that provide better dehumidifying feature than the air conditioners. As we’ve seen how a heat pump functions, let’s move on to see in detail the best thermostat for heat pumps. 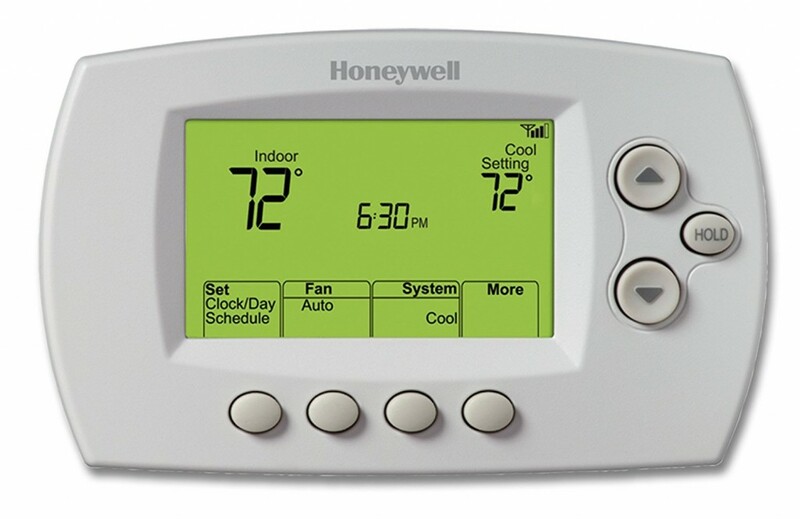 A thermostat helps in regulating the room temperature by turning the heating/cooling system ON/OFF intermittently (by sensing the current room temperature with the help of sensors that comes with every thermostat). In the case of a heat pump thermostat, the device switches the heat pump ON/OFF to maintain the desired room temperature constantly. Thermostats always improve the energy efficiency of heat pumps as it regulates the system really well. A good thermostat helps to save energy and money in the long run. While choosing a heat pump thermostat, the most important fact to keep in mind is “not all thermostats are compatible with heat pumps”. You’ve to choose a thermostat that is compatible with your heat pump. In this article, we help you choose the best thermostat for your heat pump. Let’s first see some important facts you should keep in mind while choosing a heat pump thermostat. How to choose the best Heat Pump Thermostat? #1 Compatibility – The very first thing to keep in mind is not all thermostat models are compatible with a heat pump system. There are thermostat models that do not support hvac systems with a heat pump. You’ve to read the specifications very clearly before you order your thermostat. Note: Read our guide on thermostat compatibility for popular thermostat models. #2 Wiring – The wiring required for a heat pump is different from other hvac systems like a central furnace system. So the thermostat you’re considering should support the wiring required for a heat pump. You’ve to check with the manufacturers specifications or check the model number online to see if it supports a heat pump system. #3 Heat Pumps with Aux/Emergency Heating – If your heat pump has aux/emergency heat option, then you’ve to choose a thermostat model that supports the same. Keep in mind there are thermostat models that support a heat pump but not compatible with an aux/emergency heat system. So if you’ve a heat pump with aux heat, choose a thermostat that specifically supports heat pumps with aux heat. A heat pump is really an energy efficient system and works well with moderate climates. But if the climate goes to an extreme, say a really cold winter, then heat pumps will take longer than usual to heat your rooms properly. To manage such situations, some heat pumps comes with auxiliary/emergency heating option. When aux/emergency heating mode is turned ON, rooms are heated really quickly. But this option (aux heating) is not energy efficient and adds to energy expenses. However, aux heat mode is really quick and heats the rooms much faster. #4 – Smart Heat Pump Thermostat or Budget Friendly Programmable Model ? Finally, if you’ve done the most important matter of shortlisting a couple of thermostat models that supports your heat pump, then its just a matter of choosing which all features you want and your budget. There are smart heat pump thermostats (like Nest, Ecobee, Honeywell Lyric, ) which comes with a full load of useful features like self learning, auto programming, wifi & controlling via mobile app, geo-fencing , voice control etc. All looks good with a smart heat pump thermostat, but those high end features comes with a price tag as well. If your budget is low, you can go for a normal programmable thermostat for heat pumps, which is more than enough and serves the purpose of regulating temperature & maintaining efficiency. Let’s have a look at some of the best heat pump thermostats available in market. As we’ve explained above, smart heat pump thermostats come packed with a bunch of smart features like self learning, auto scheduling, geo-fencing, energy savings and more. If you’ve enough budget, its always wise to choose a smart programmable thermostat for heat pumps – as they save energy like no other thermostats. In fact, a smart thermostat can pay for itself in 2 years time-frame as energy savings on your bills. Our first pick as the #1 choice for a heat pump smart thermostat is Nest 3rd Generation thermostat. This model supports heat pump systems and heat pumps with auxiliary/emergency heating. In the case of heat pump with auxiliary heating, this model supports upto 2 stages of heating/cooling with aux heat for heat pumps. Nest 3rd Gen & Ecobee 4 are the best smart thermostats for heat pump based systems. They both supports multi stage heat pumps and when it comes to aux heating, they both support upto 2 stages of heating. Nest and Ecobee smart thermostats are WiFi enabled, and is probably the best WiFi thermostat for heat pump systems. Nest 3rd gen model will turn ON the aux heat system only when it is necessary (only when the outside temperature falls below the aux heat lockout temperature). By default Nest will activate the heat pump balance, which then automatically determines the aux heat lockout temperature. You might already know that Nest is a self learning thermostat and it learns your living habits to program itself automatically. A nest thermostat usually takes 7 to 10 days (from the day of installation) to learn patterns and to program itself to give you maximum energy savings. Nest E Thermostat – Nest has a budget friendly heat pump smart thermostat named Nest E – compatible with heat pumps and also with aux/emergency heating. We’ve detailed the difference between Nest E and Nest 3rd Gen in our review article. Both Nest E and Nest 3rd Gen are WiFi enabled and can be used as a WiFi heat pump thermostat. If you look at the backside of Nest Thermostat, you can see labels (O/B , AUX/E) – which means this thermostat is compatible with heat pumps (O/B) and also compatible for heat pumps with aux/emergency heating (AUX/E). So a convenient way to check if a thermostat model is compatible with heat pumps is to check its wiring labels. If you see O/B – it is heat pump compatible and if you see both O/B and AUX/E – it is compatible for heat pumps with aux heating. Ecobee 4 is our #2 choice but this thermostat is as good as Nest 3rd Generation model by all means. Ecobee is a Canadian company making smart thermostats for North American regions and they are really good at it! Ecobee 4 is their full featured smart thermostat model and it supports Heat pumps (4H/2C – 4 stages of heating & 2 stages of cooling) and also Heat pumps with auxiliary/emergency heating (2 stages of aux heating). Notes: Ecobee 4 supports accessories (that usually comes with heat pumps) like a humidifier, dehumidifier, ventilator, ERV or HRV. WiFi Enabled – Ecobee4 is one of the best WiFi heat pump thermostat model, just like Nest 3rd Gen variant. 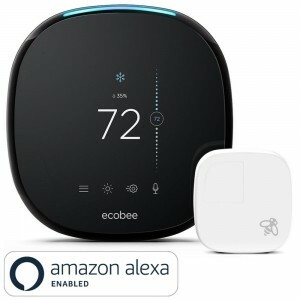 You can connect Ecobee4 to your home WiFi and control via smartphones or your PC. Builtin Amazon Alexa – Ecobee4 comes with built in Alexa which enables voice control of the device. You can also avail full feature of Alexa like read news, search the web and like more! Learning Ability – learns your living habits and programs itself via machine learning. Ensures maxium energy savings. Away Home Control – control the device via Internet using mobile app. Ecobee4 is also compatible with Google Assistant, Apple HomeKit, Samsung SmartThings. Ecobee 3 Lite (Budget Model) – Just like Nest E, Ecobee also has a budget friendly smart heat pump thermostat named Ecobee 3 Lite – which is a trimmed down version (in features & build quality) of Ecobee 4. This model Ecobee 3 Lite is compatible for Heat pumps (2 stages Y1 and Y2) and also for Heat pumps with aux heating (2 stages of aux heat – W1 and W2). Note: Ecobee 3 Lite does not have accessory terminals to control whole humidifier, dehumidifier or a ventilator. The 3rd one in our list is a model from Honeywell, with model name RTH9585WF. This is one of the best selling WiFi Heat Pump Thermostat with smart features like WiFi/Wireless control, touch screen, voice control using Amazon Alexa, long distance control via internet using mobile apps and a lot such features similar to those offered by Nest and Ecobee models. The only major drawback is its conventional box shaped design which is not appealing & contemporary! Nest & Ecobee follows a sleek, round shaped, minimal design pattern for all of their models – which is definitely trendy & suits any modern interiors. Note: This model is in fact an upgrade of the best selling model – Honeywell RTH9580WF. Both are still available for sale in online stores. But we believe the newer model RTH9585WF is the best choice and value for money. Compatibility:- This model RTH9580WF works with both Heat Pumps & Heat pumps with Aux/Emergency heating. This model is compatible upto 2 stages of heating. For cooling, you can set the “cooling changeover valve” mode – which is set by default (refer installation manual for more details). Read our full review of – Honeywell RTH9585WF – Smart WiFi Heat Pump Thermostat. Essentially Smart – Almost all essential features of smart thermostat except ‘self learning’ of Ecobee & Nest. Essential features like voice control (compatible with Amazon Alexa), WiFi control, remote control using mobile apps (iOS & Anddroid versions), touchscreen, holiday scheduling, smart energy savings are available in this model. 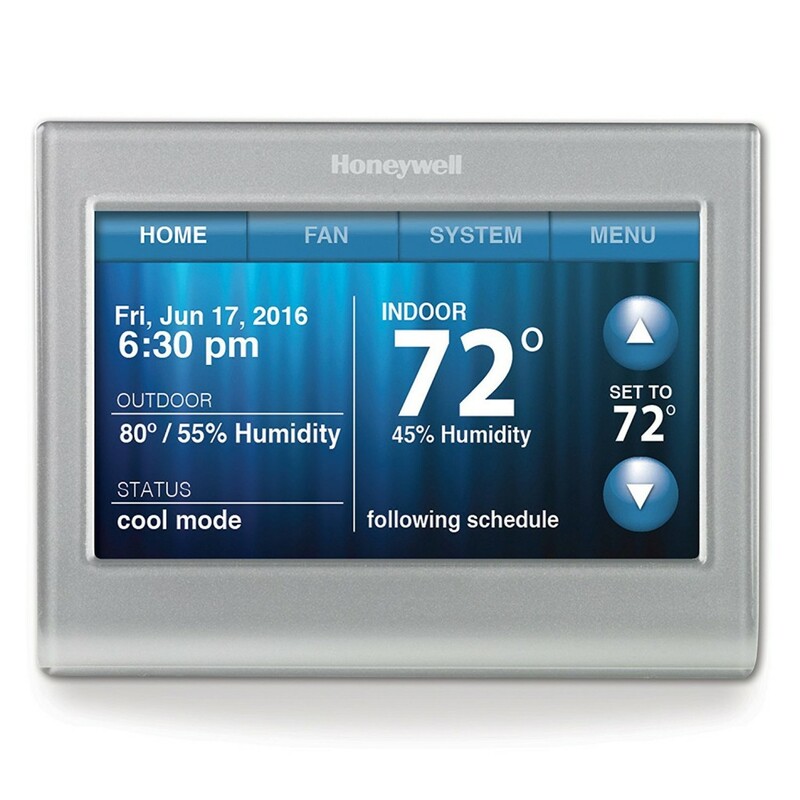 Big Display & Touch Screen – Unlike Ecobee & Nest (which are sleek & minimal) this Honeywell model has a bigger display. This is a blessing for people who prefer bigger displays & easy readability while setting up & programming schedules. Big displays also serve well people with vision problems. The touch screen has multi colors & you can set a color that match your indoors. Note: Touchscreen can be locked (with password) for safety as well. 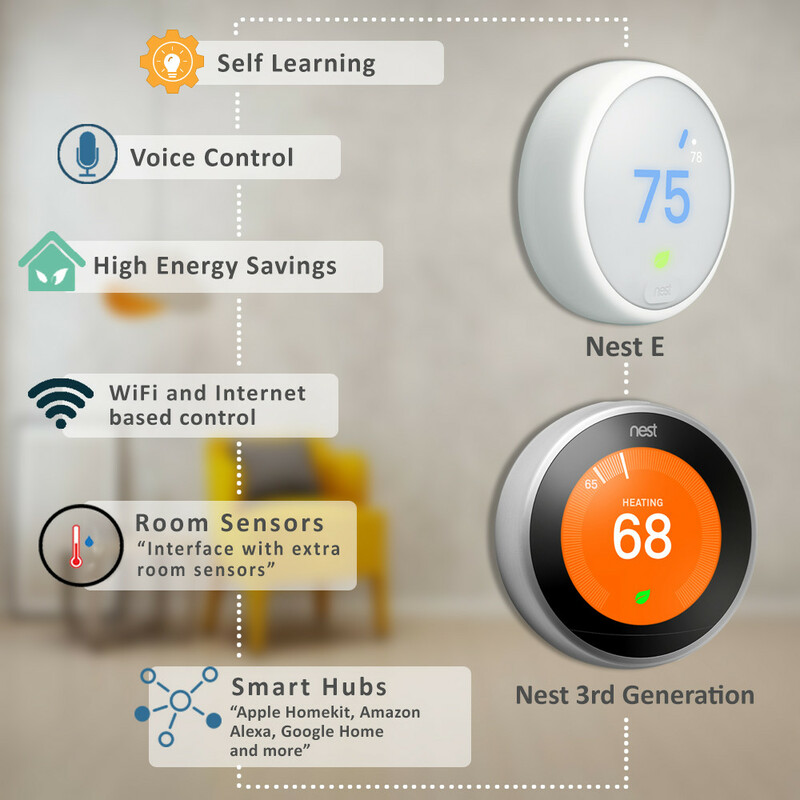 Not Self Learning – Ecobee & Nest are self learning thermostats. This means you don’t need to program them manually. They learn your habits & schedules and they program themselves a schedule that best suits your lifestyle & at the same time saves you maximum energy bills. In the case of this model (RTH9585WF) – you’ve to program the thermostat manually. The next in smart thermostat category for heat pumps is the Sensi smart thermostat for heat pumps. 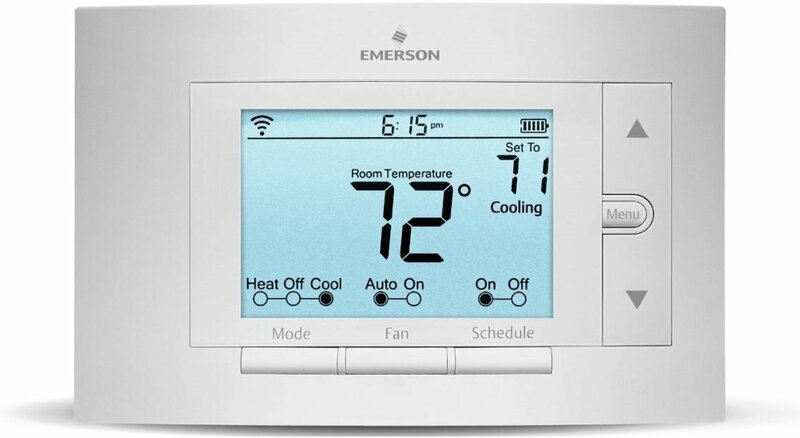 This thermostat is a product from Emerson thermostats and is designed to work with your existing wires. Therefore it has an easy and quick DIY installation procedure. It does not require a common wire(c-wire) and hence is compatible with most of the heating and cooling systems. 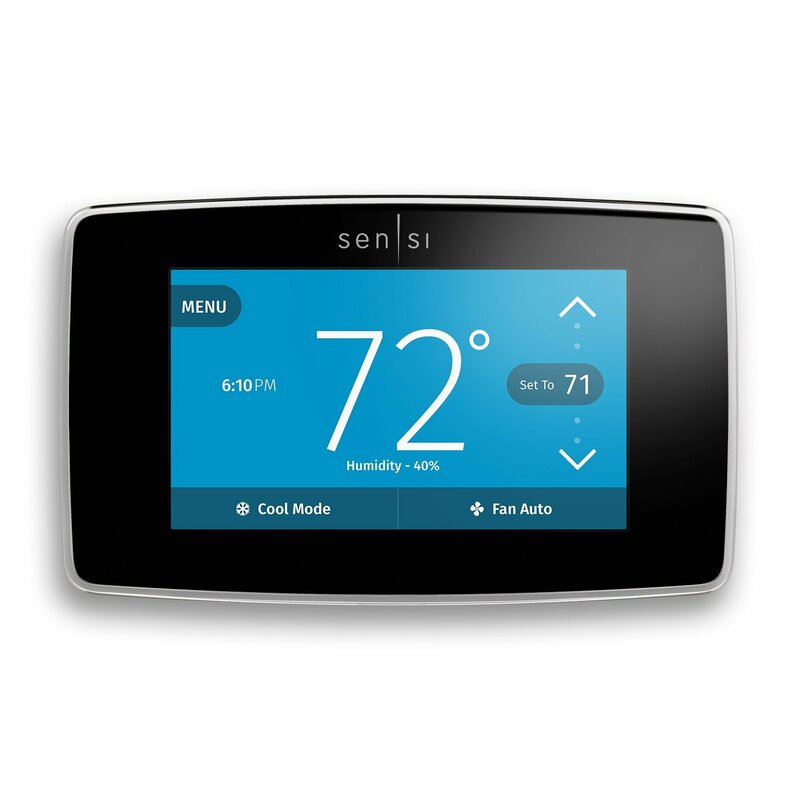 WiFi Enabled – Sensi ST75 is also one of the best WiFi thermostat for heat pumps. 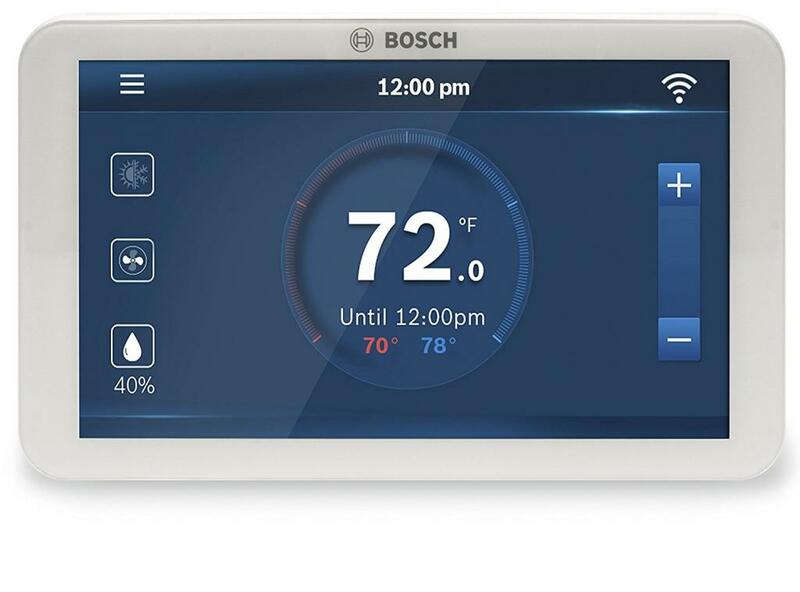 Just like other WiFi enabled thermostats, you can control your Sensi ST75 via home WiFi. Choose the geo-fencing feature and your thermostat will automatically set the temperature according to the local climate. Reduce the unnecessary energy usage by creating a 7- day programming schedule. Remote control feature helps you control the temperature and time settings from your smart phones, tablets and computer. It is not compatible with electric baseboard heaters. It is compatible with almost all HVAC systems, although a c wire would be required for heat-only , cool-only and heat pump systems without aux. We’ve crafted a dedicated guide featuring exclusive WiFi enabled thermostat models suitable for different types of HVAC systems. If you’re looking for a WiFi heat pump thermostat, you should definitely read our guide. It comes with Wi-Fi remote access so that you can use your iOS or android device to control its settings from anywhere. You can mange one or more thermostats using this feature. It comes with smart response technology that learns to pre-heat or cool your home at pre-programmed times. It is pre-programmed with schedules that aim at reducing your energy usage. It is compatible with heating and cooling and heat pumps, but does not work with heat pumps with electric baseboard heat (120-240V). The installation process is easy thanks to its browser interface/smartphone app interface, that guides you through the installation process. 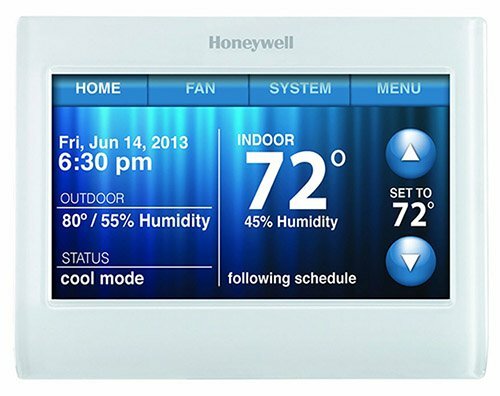 You can set the settings even without a Wi-Fi, as it has all the functions of a conventional programmable thermostat. Apart from giving you remote access to the temperature settings through your iOS or Android devices, this Wi-Fithermostat sends you updates via email, when asked to do so. It requires a c-wire, hence is compatible with 3Heat/2 Cool heat pumps and 2 Heat/2 Cool conventional systems. Alexa-Voice enabled, this means you can control the thermostat with your voice when you are at home. You can manage schedules of up to 4 thermostats using the BCC100 mobile app. It is compatible with Heat Pump (4 Heat, 2 Cool) or Conventional (2 Heat, 2 Cool) systems, any 1-wire internally powered humidifier or dehumidifier, and most 24 VAC HVAC systems. Connect to an existing Wi-Fi network at your home, and remotely program the schedule over the app or browser on your device. Control the thermostat using your voice, as it is enabled with Alexa voice recognition technology. The 7 day programming is simple and selectable. This means if you are not inclined towards programming the schedule, you have the option to use this thermostat as a non programmable one. It comes with energy savings mode feature. Emerson sensi touch thermostat has been named the ‘Best Overall’ smart thermostat of 2017 by USA Today’s Reviewed.com. It has HD touch screen that displays the room temperature and has intuitive menus and back glow. It is designed for hassle free DIY installation, with step by step guide given in its app. Download the Sensi app on your mobile and enjoy the remote accessibility of the control features of this thermostat. It will alert you in case of extreme temperature and humidity levels in your home. It has geo fencing feature that can be used for location based temperature control. 7-Day flexible scheduling helps to reduce the HVAC related energy consumption. It has a 7 day programmable schedule with four periods for each day. Setting the schedule is easier with its large, easy-to read backlit display. The easy install wizard guides you through each step of installation. It has compatibility with heating, cooling and heat pump systems. Heat pump systems – Up to four stages of heating and two stages of cooling (with or without auxiliary). Also compatible with gas, electric, oil systems, as well as millivolt applications.It is compatible with the gas, oil, geothermal, heat pump and radiant heat systems – up to 4 stages of heating and 2 stages of cooling. Also compatible with gas, electric, oil systems, as well as millivolt applications. Easy to set up the schedule, with customisable control for a cosy home. It automatically changes from heat to cool, depending on the program set up. It gives a precise temperature of 1 degree. You can program a schedule for four different intervals a day. It has a temperature precision of 1 degree farehenheit. The push button display interface is extremely user friendly and so is its installation. It is compatible with heating, cooling and heat pumps without auxiliary heat, but does not work with electric baseboard heat (120-240V) OR multistage HVAC systems. It can work like a 7 day programmable thermostat as well as a non programmable thermostat, according to the mode you choose. It has 5-1-1 day programming capability; this means you can set a schedule for 5 weekdays and two different schedules for the other two days of the week. It has inbuilt advanced features such as keypad lock, temperature limits and backlight button. It is compatible with Heat Pump (2H/1C) but not compatible with electric baseboard heat and some other systems. It comes with built-in instructions on how to use various features efficiently. The 5-1-1/5-2 day programming schedule is built in to reduce your energy consumption via HVAC systems. The adaptive intelligent recovery feature ensures programmed temperature is reached by programmed time. It works well with all central heating and cooling systems including heat pumps without auxiliary heat source. It is designed to provide electronic control of 24 V ac conventional and heat pump systems or 750 mV heating systems. It has a selectable periods(2 or 4) per day. You can program different schedules for the weekdays and the weekends. It is compatible with heating and cooling systems apart from systems with electric baseboard heat (120 or 240 volt) and systems with 2-cooling stages. This one category of thermostats is ideal for those who like the conventional thermostats. It does not have a programmable memory but has digital display and simple control settings. This non programmable thermostat is mercury free and thus the precision is quite good. Also with easy to read, green backlit digital display the control of this thermostat is convenient.You can set the temperature according to your comfort and then let the thermostat do the rest. It will maintain the room temperature at the set value. It is dual powered (hardwired/battery). It has push button interface that is very convenient to use.This thermostat works well with Multistage Heat Pump Systems (Heat Pumps with and without Auxiliary heat source). This is another non programmable digital thermostat from Honeywell. It has a 1.5 square inches, green backlit display and push button interface.It has an easy access battery replacement door and is dual powered(Hardwired/battery powered). It is designed provide electronic control of 24 V AC conventional and heat pump systems or 750 mV heating systems. It is compatible with 1 heat/1 cool conventional systems and heat pumps with no auxiliary. This one non programmable digital thermostat from honey well features advanced temperature monitoring that is aimed to minimize temperature swings to give you a comfortable and cosy home to live in. The green backlit display along with the soft key push button interface makes it extremely user friendly. It is very easy to set the temperature with the up/down buttons.The set temperature is maintained even when the thermostat restarts after a power outage.It is compatible with Works on all central heating and cooling systems including heat pumps without auxiliary heat source. These are some of thermostats that I have picked up to guide you through the process of choosing the best option when it comes to buying heat pump thermostats. As already mentioned, the first thing you should know while shopping for thermostat is the type of heating/cooling system you have at your home. Then comes in the budget and the kind of features you want. The smart thermostats are equipped with ample number of features from setting the schedule for you to even reading out the daily news for you. Most of the Wi-Fi thermostats come with remote access to the control settings. The non-programmable thermostat is the most basic type and all you have to do is set a temperature and it will maintain the temperature with precision of about 1 degree Fahrenheit. This is all about heat pump thermostats in this article. I am tempted by the bosch thermostat, just curious if you think there is a better Honeywell one? Ian, Choosing a brand is obviously personal. You might be choosing Bosch for very specific reasons. 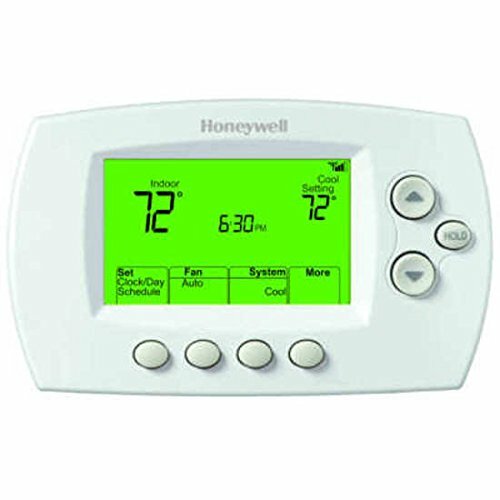 If you’re asking me an opinion, I would say Honeywell is a leader in Thermostats and they’ve lots of models in market. Bosch, on the other hand has only a select few models available. If you’re considering a smart thermostat, you’d be better off with Ecobee or Nest thermostats. In the class of WiFi models, Honeywell RTH9585WF is a great choice. Finally, Bosch is also equally good and serves the purpose and Bosch has a reputation to keep. All of these models serve as a good heat pump thermostat. Final decision should be based on your individual judgement. In order to work with heat pumps, does the thermostat need to be hard wired to the heat pump? I’ve lived in three houses that all had heat pumps and none of them (including my current one) were wired to a thermostat, they all just work off the remote. Yes. You need to wire the thermostat in sync with your heat pump. For ex: Your heat pump will have wires coming out marked Y1, Y/Y2, W, G, R, C etc. Your thermostat will also have markings similar to this like Y1, W, G, R, C etc. You’ve to match this and wire accordingly. Each thermostat model is different, so you’ve to read wiring instructions from the manufacturers sheet. What if your wifi / internet is down, will a heat pump still know when to kick on the Aux heat? Does the next 3rd generation have the ability to sense the outdoor temperature when it doesn’t get the temperature from wifi? @David – WiFi/internet connectivity is not necessary for a heat pump thermostat to do basic & necessary function. Turning ON “emergency/aux heat” is a necessary function. Usually “aux heat” is turned ON when temperature falls suddenly, or is very low than normal range. So for most thermostats, “aux heat” will turn ON without internet connectivity.